Included: Your knowledgeable guide James • Pick up and drop off to your hotel in Devon or Cornwall. Commence our walking tour of historic Dartmouth. 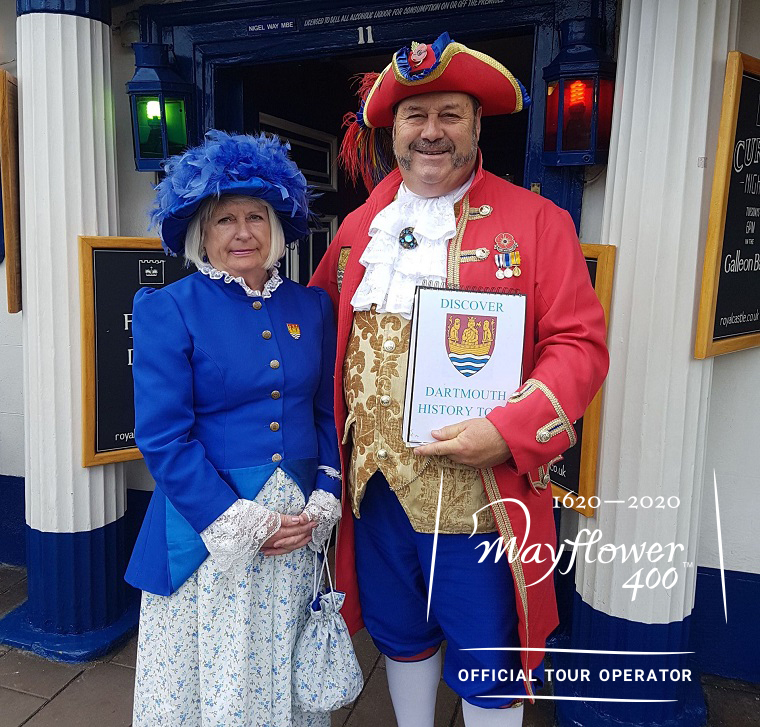 Subject to availability, this could be conducted by Les and Liz Ellis, the town crier and Consort in their full, magnificent regalia to add some authentic flavour to the experience. We visit the town with its ancient buildings, see the beautiful estuary of the River Dart, and visit Bayards Cove with its elegant Inn, housed in a 14th Century Tudor House! To be taken at an appropriate location depending on your preferences. Ancient country pubs, cosy cafes etc. are all possibilities. The historic Port of Plymouth was once the Maritime Capital of the World! We will learn about some of the many voyages of discovery which left from the City, where the Mayflower finally left on its famous voyage. We’ll visit the historic Barbican area and see the Mayflower steps and Museum and also Island House where many of the Pilgrims lodged whilst in the town. We continue our exploration of Plymouth with a visit to The Blackfriars Distillery and home of Plymouth Gin. The refectory is said to be the room where the Pilgrims had their final supper before departure. We may take an optional guided tour of the Plymouth Gin distillery. Next stop is to stand on Plymouth Hoe, looking out on one of the worlds finest natural harbours. Here you are standing on history itself, the scene of some of the worlds most iconic voyages, including of course the sailing of the Mayflower.